You can see from the table, that the processes vary from 2 to 8 steps. 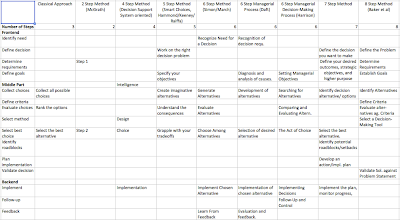 In total, there are 15 different steps listed in order to make all processes comparable. The processes are broken down in a frontend, middle part and backend. The frontend is about the planning and defining the decision, the middle part is about making the selection and the end part is about implementing the selected choice and reviewing the results. The middle part is mostly populated, while the frontend is covered more than the backend. The more steps, the more likely there is a contents for the backend. While many discuss the success of the decision based on the implementation, nearly half of the processes never cover the implementation. From the steps with the lowest counts per occurrence, the point select decision method and develop an implementation plan/identify potential blocks are the one, that caught my attention. In my view, the 15 different tasks are not equally important, but all are required to make a very good decision. More information about different decision making processes: List of all reviewed decision-making processes. Step 1: Recognition of decision requirement. A decision requirement can be based on a problem or an opportunity. Managers scan the environment regularly, to identify whether there are internal or external factors that require decision action. Step 2: Diagnosis and analysis of causes. You will refine your understanding of the actual situation and identify the root causes. Step 3: Development of alternatives. Next step is to generate alternatives solutions that will respond to the needs of the situation and correct the underlying causes. Step 4: Selection of desired alternative. Choose best alternative which is the solution that best fits the overall goals and values of the organization and achieves the desired results using the fewest resources. Step 5: Implementation of chosen alternative. This stage involves the use of managerial, communication, administrative, and persuasive abilities to ensure the choice is carried out. The success of a decision is based on how it is implemented. Step 6: Evaluation and feedback. Gather information that tells you whether it was effective in achieving its goals and how well the decision was implemented. Feedback is the part of monitoring that assesses whether a new decision needs to be made, and if so it will help them get back on track. The process is a good list of verbal phrases of activities, but no clear activity titles, also each can be changed into a verb. The front end and the backend are complete in my opinion. The middle part is rather thin in the evaluation of criteria how to select the best alternative. More information about different decision making processes: List of all reviewed decision-making processes. See the comparison of the optional decision-making methods for further study. Step 1: Define the decision you want to make. Focus and narrow the decision to something that is clear and specific—and where we have real choices. What method of decision making will we use (intuitive or rational/analytical)? Narrow the decision: Develop a decision statement that is specific, narrow, and within our sphere of influence and action. Identify whom to involve: Who has key information essential to an effective understanding of the issue that needs addressing? Who will be expected to implement whatever decisions are made? Step 2: Define your desired outcomes, strategic objectives, and higher purpose. When the decision is made, what will the short-term solution look like? What are your desired objectives and outcomes. What is your strategic objective in making this decision? How does this decision relate to the vision and strategic goals? What higher purpose or long-term goal will be achieved through making this decision? Identify measures of success: How will you know that the decision you have made is the right one? How will you measure the quality of the final decision? How will you evaluate the outcome’s contribution to the organization’s strategic agenda? Sort out “musts” and “wants”: Review the list of objectives and outcomes and identify those that are must objectives (characteristics that the eventual solution must have or must satisfy) and those that are want objectives (desirable characteristics, but not required). Rank-order the wants from most to least important and assign values to each (10 = most important; 1 = least important). 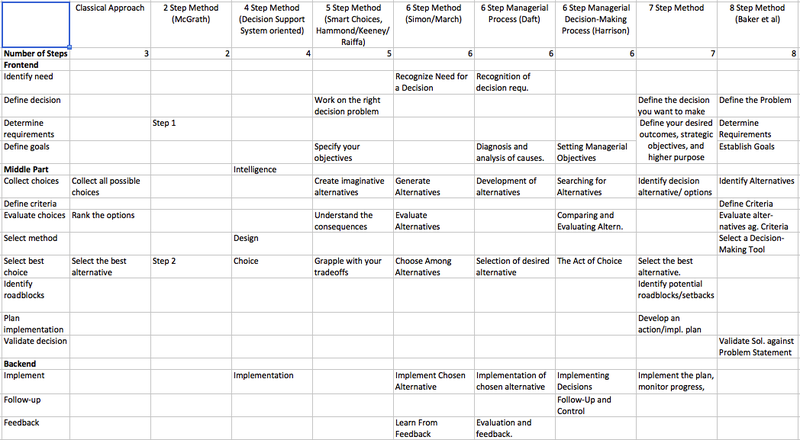 Step 3: Identify decision alternatives and options. Identify at least three or four possible decision alternatives. If there are no alternatives, then your decision is whether to implement your only option. Step 4: Select the best alternative. Apply the musts and weighted wants criteria. The best alternative satisfies all the musts and is best at satisfying the wants. Step 5: Identify potential roadblocks and setbacks. What are the possible forces, factors, events, or constraints that may inhibit progress in successfully implementing the decision? 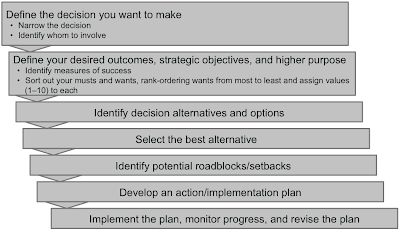 Step 6: Develop an action/implementation plan. What actions should you take to implement the selected decision? What actions will you take to proactively respond to potential roadblocks and, therefore, protect our plan? Who is responsible for taking the specified actions? When will the actions occur? 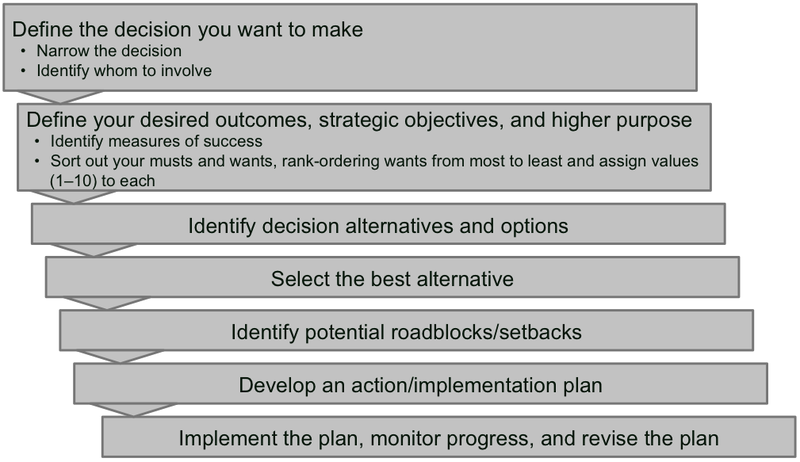 Step 7: Implement the plan, monitor progress, and revise the plan. Implement the plan and monitor the results. Are you seeing the desired results? What actions need to be revised? What new actions should take place? What should you keep doing? This seven step process is a complete process description based on described activities. The frontend description is complete, looking at the definition and the linkage with higher level decisions such as a strategy. The act of choosing the best option is described in detail, a simple evaluation framework is described. The use of must and want criteria is good. The use of a more elaborate evaluation scheme would be beneficial in the process. The end with identifying roadblocks, planning and executing the implementation is rather complete, but misses a final review for your own learning. The process works well for up to 10 want criteria, otherwise the ranking is impossible, since the values only range from 10 to 0. If you compare this process to other decision making process, this process does not fit well with the other processes. While the other processes support the selection of different courses of actions, this process supports the development of a course of action and tools for making a decision with a lot of future impact. This decision making process is used in medical and intelligence fields. The process is described with activities in mind. It describes in clear terms, how to move forward and how to create such a decision. The process is not very well defined in the beginning, the frontend is very fuzzy. There is no definition of a decision, no framing or whatsoever included in the process. The direction for the intermediate steps are very detailed, and looking at the wording, you can see the origin from medical and other intellectual fields. The interesting part is that you are trying to disprove a hypothesis, not try to focus on finding the supporting evidence. If the hypothesis is wrong, you will find this quickly. While the process stops with report conclusions, there is no support for the implementation or execution of the next steps. This is a description of the process with a lot of text from the guidebook by Baker et al. 2002. A good problem definition expresses the issue in a clear, one-sentence statement that describes both the initial conditions and the desired conditions. Everybody involved in the decision-making process needs to agree on a written problem definition before proceeding. Any acceptable solution to the problem must meet the requirements. Requirements describe what the solution to the problem must do. weight, lower costs, lower health risk, etc. Goals go beyond the minimum essential must have’s (i.e. requirements) to wants and desires. Goals should be stated positively (i.e. what something should do, not what it shouldn’t do). Alternatives offer different approaches for changing the initial condition into the desired condition. Generally, the alternatives vary in their ability to meet the requirements and goals. Input from the decision-maker(s) is essential to the development of useful criteria. Moreover, the decision-maker’s approval is crucial before the criteria are used to evaluate the alternatives. The method selection needs to be based on the complexity of the problem and the experience of the team. Generally, the simpler the method, the better. 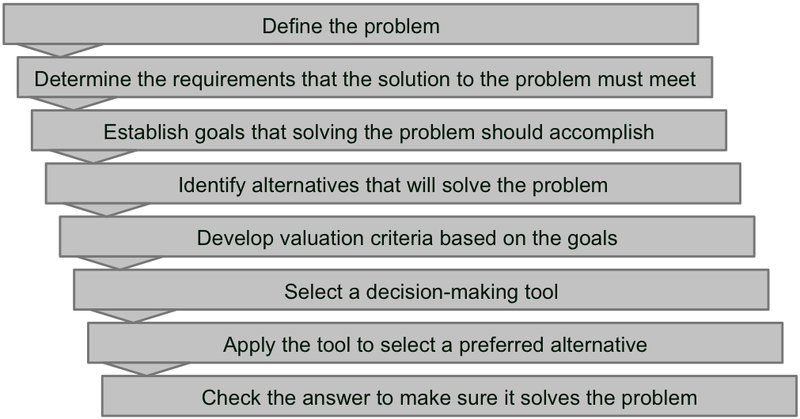 There are several decision-making tools available, they will be part of one of the next blog postings. Alternatives can be evaluated with quantitative methods, qualitative methods, or any combination. Criteria can be weighted and used to rank the alternatives. Both sensitivity and uncertainty analyses can be used to improve the quality of the selection process. After the evaluation process has selected a pre- ferred alternative, the solution should be checked to ensure that it truly solves the problem identi- fied. Compare the original problem statement to the goals and requirements. A final solution should fulfill the desired state, meet requirements, and best achieve the goals within the values of the decision makers. The eight step method describes a process with 8 activities, all using the verb noun notion. The front-end is very clearly described. The separation between requirements and goals may be fuzzy for a few criteria, but they are included in one of the two ways. The selection process is described in many detailed activities and the evaluation is linked to many possible tools and techniques.The last step is a review of the results, whether they fulfill the problem statetement. The linked decisions tools and the description is short and meaningful. Implementation and feedback steps are completely missing in this process. The process is very complete in the front-end part of the process, but the decision execution is completely missing. The managerial objectives are the ends for the means of decision making and constitute the foundation for rational decision making. How you attain the objective is the measure of decision success. Searching alternatives is limited by time and money. You need to balance the rising cost of attaining additional information with the declining value of this piece of information. You need to stop the search in the zone of cost effectiveness where the cost of additional alternatives is lower than the value of the alternative. The search result are usually three to five alternatives, with one alternative of doing nothing. 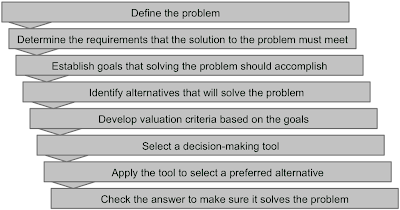 The alternatives from step 2 are evaluated using criteria derived from the objective from step 1. The evaluation includes an anticipation of the likely outcome for each alternative and also anticipate obstacles or difficulties during implementation. The choice is the culmination of the process, not all of it. This step confronts the decision maker with discernible constraints. The choice is the alternative most likely to result in the achievement of the objective. The decision success is a function of decision quality and decision implementation taking into consideration the operating constraints, the influence of the decision maker and the involvement of decision implementers without a conflict of interest. The "Follow-up and Control" step is essential to ensure that an implemented decision meets its objective. The performance is measured by observing the implemented decision in relation to its standard derived from the objective. Unacceptable variance from standard performance should elicit timely and appropriate corrective actions. Corrective actions may result in the implementation of another alternative, which, if not successful, may result in a revision of the original objective. The process is another six step process with mostly action descriptions, the one voiced as a noun is using the noun "act". So this is a real process and it includes feedback loops within the process to improve the decision making, if the straight forward step process is not leading to the right results. In the high level description, the first step is good, but nowhere the decision is really defined so the searching for alternatives can be looking at the wrong alternatives. The description in the front end of the process is good and gives general guidance on how to perform some of the steps. The step "Act of Choice" is overrated in my opinion, the description for implementing decisions (why, by the way, are there multiple decisions implemented?) is not describing the process but how to measure the success. The feedback and control step is a major step to help check for the quality of decision. More information about different decision making processes: List of all reviewed decision making processes. See the comparison of the optional decision-making methods for further study.